Sooth and relax your body today with our microwaveable body wraps. In 100% cotton, our wraps are filled with wheat blended with pure lavender leaf to create a therapeutic wrap that can be used hot or cold to ease, relax and sooth your body. Whether you`re treating sports injuries, tension, or you`d just like to enjoy the textured feel of the wheat moulding to your skin and the subtle lavender fragrance, this is the perfect treat for you as well as an ideal gift for your loved ones. Heat the body wrap following the instructions and heating time table below. Place half a cup of water inside microwave. Place the body wrap onto a non-metallic plate and place inside microwave oven, making sure the filling inside the body wrap is evenly distributed (this helps avoid hot spots occurring during heating). Below are reviews of Aroma Home Soothing Body Wrap - Lavender Fragrance - Grey by bodykind customers. If you have tried this product we'd love to hear what you think so please leave a review. 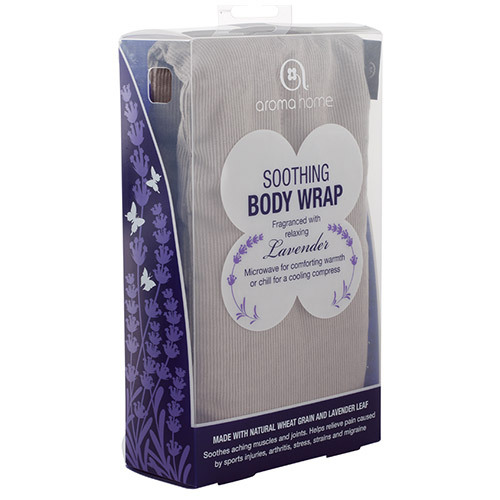 Aroma Home Soothing Body Wrap - Grey soothes and relaxes your body. 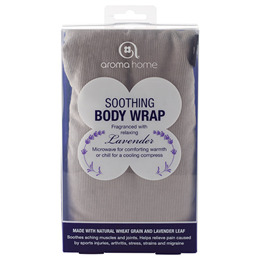 In 100% cotton, our wraps are filled with wheat blended with pure lavender leaf to create a therapeutic wrap that can be used hot or cold to ease, relax and sooth your body.